Call me ‘old school’, but I adhere to the school of thought that no Holiday is complete without something practical, a gift you actually need and can use, even if you don’t necessarily want it. Usually since it’s a gift, I will splurge on a more expensive, nice version of said item. For example, all my kids get underwear and socks in their stockings at Christmas. When they’re ready to go back to school, or just need new pairs I typically go with good old Hanes. Can’t go wrong there, but for Christmas I splurge and get them Calvin Kline or Hurley, etc. I apply these same principles to my loving husband. Somehow, my husband is always in need of new socks. I swear there’s an evil laundry gnome that always steals just one of his socks at a time. Always one from a nice matching pair. So, in addition to whatever gift I get for him and our children pick out for him he always gets, you guessed it, a brand spanking new package of snazzy socks. Usually, I wrap them just so the kids get to see him opening an extra gift, even though we all probably know what’s in the slightly squishy package by now. Last year, I decided I needed to shake things up a little. Every year for Mother’s Day I get a bouquet of flowers, purchased by my husband, but from my children, and decided that for Father’s Day he needed his own ‘bouquet’. 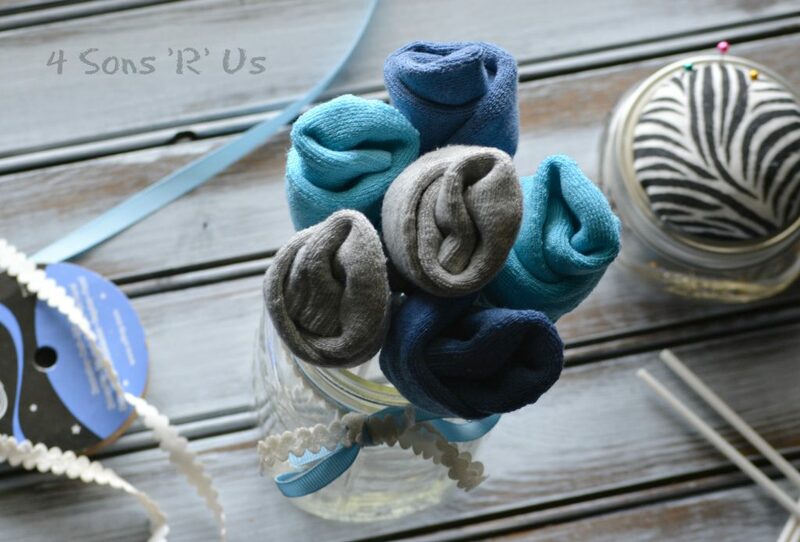 Enter: the sock bouquet. I had just watched a dear friend of mine make a sock bouquet for a baby shower she had been to, and got busy with a new 6 pack of socks for my hubby. When he sat down that morning he was greeted with breakfast, gifts, and his own dozen ‘flowers’. Everyone got a tickle out of it, and a new tradition was born. Lay a single sock out flat. 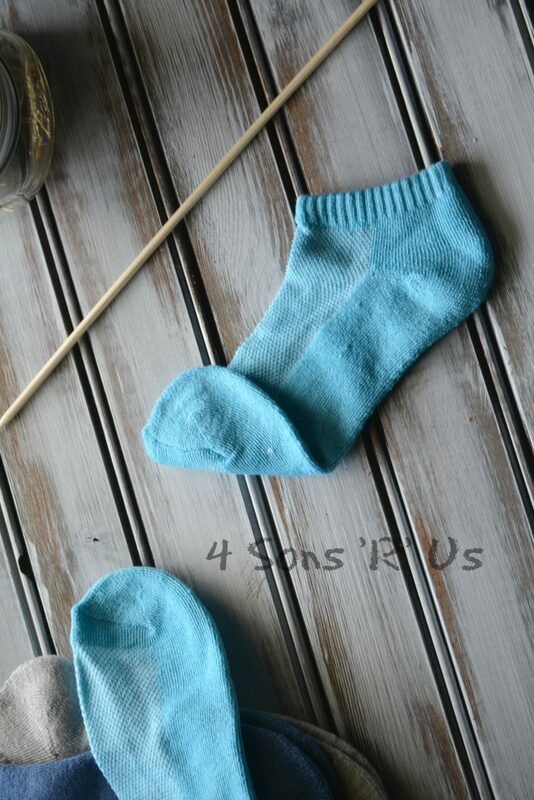 Start by laying one sock out flat, and then fold it over once at the bend in the sock, like shown above. 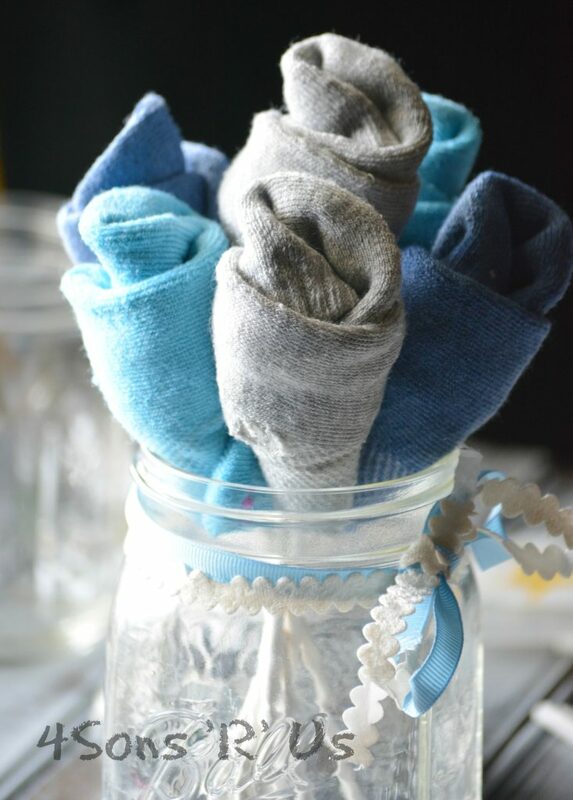 The longer the sock– the ‘fuller’ your flower will look. The hubs won’t wear long socks, so crew cut or ankle length are what I had to work with. Begin rolling on the “open” end. Keep the roll tight as you move along. Keep rolling until you get to the toe of the sock, then pin it closed. Repeat this as many times as needed for the desired amount of ‘roses’ in your bouquet. I opted for 1/2 dozen, but 1 dozen would look nice and full. It may take a minute to get the hang of it, but after the first one or two you should be on a roll and be able to have a full bouquet done in just a few minutes. 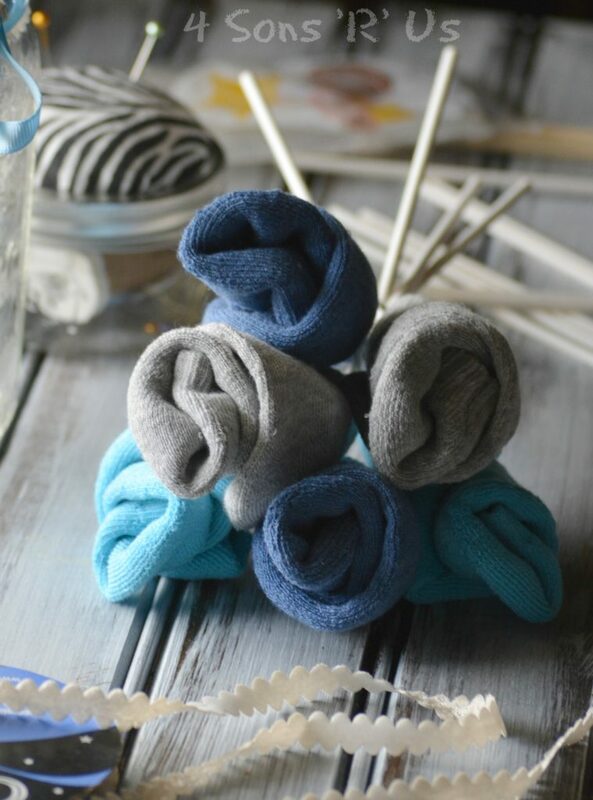 Carefully insert a wooden skewer or lollipop stick into the bottom center of each sock rose. When the sock is securely positioned on the stick, place it in the vase. Froof your bouquet until it’s arranged to your satisfaction. 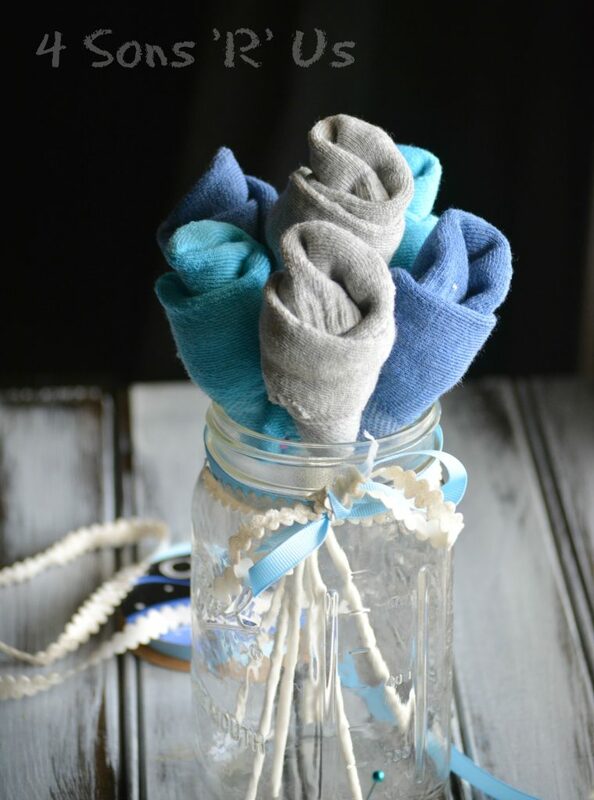 Tie a ribbon around the vase in the shape of a bow for a finishing touch. Now you’ve got a cute, fun, and frugal gift that’s sure to elicit a tickle from both the Dads and the kids. Now that is a fun little Father’s Day gift! And I don’t know any father who couldn’t use more socks!